Security. The FireFly ESV is Ready to Serve and Protect. The FireFly ESV is a strong, dependable vehicle for security patrol applications. The FireFly ESV® is specifically designed for flexibility and quiet operations. Security patrols take place in a wide array of environments including cities, office complexes, retail malls, and educational institutions. The FireFly ESV offers many fundamental benefits to security patrol and community policing. These benefits will build positive relationships with both businesses and residents. Easily travels 90+ miles on a full charge. Is energy efficient, reducing costs over a gas powered vehicle by up to 80%. Provides comfort and security for the driver with a 3-point safety harness. Is ready for both rapid response and light pursuit – at speeds exceeding 50 mph. Has visibility, powerful presence, and maneuverability which are essential to a successful patrol. Allows security officers to patrol quietly and at slow speeds. 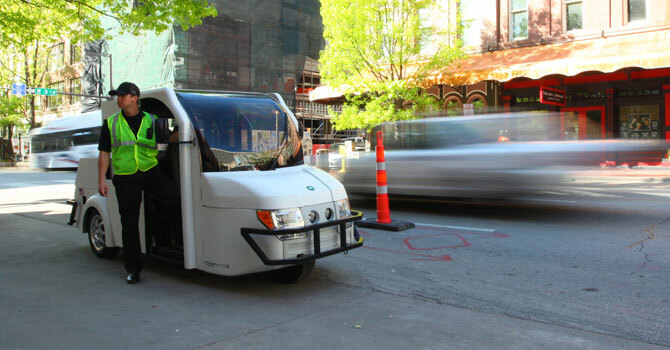 Has a tight turning radius, which gives security officers the ability to maneuver between rows of vehicles. Is very visible with its LED beacon lights. Can sit for hours with its beacon lights flashing while an officer directs traffic.